Narrative essay writing is best taught with a combination of brainstorming, outlining and practice writing exercises that encourage students to write in the past tense and use appropriate transitions. Teaching narrative essay writing is quite enjoyable as it allows students to write about personal experiences. 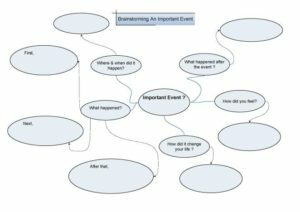 This is a brainstorm worksheet for a narrative essay about an important event. Click on the image below or the link .to download the printable PDF file. This is an exercise to help students understand transitions in narrative essays. This is an exercise challenging students’ understanding of narrative transitions. They have to create an appropriate narrative situation for each transition. 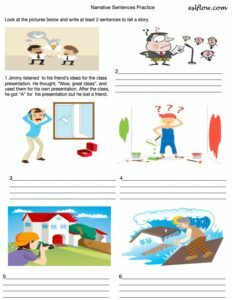 This is an exercise for students to practice writing narrative or past tense sentences. Students look at the pictures and try to tell a story in 2-5 sentences. 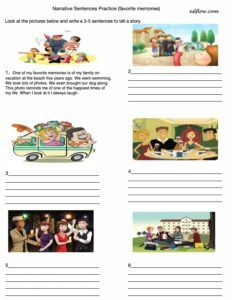 This is an exercise for students to brainstorm ideas and write sentences in preparation for a personal profile essay using narrative techniques. On page 1 they use the vocabulary to write short sentences for suitable for each picture. 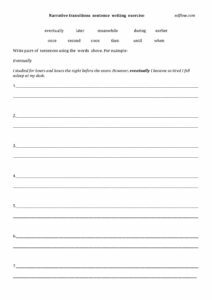 On page 2 they write the sub-topics they might use in an essay and explain their experience in a few sentences. The answers for First Day at University are on the second page of the PDF. Just open the PDF. I double checked it.